Particpants at the recent Digital Inclusion strategy workshop. Over the last few months, we’ve been carrying out consultations on the Digital Inclusion strategy with a wide range of digital inclusion thought leaders and practitioners across sectors. This culminated in a workshop with our Digital Inclusion Delivery Board and Departmental Group. The feedback process has helped us iterate and refine our strategy, and these conversations will help us get the support needed to make the strategy a reality. We’re keen to keep the conversation open and inclusive, so we’ve written this blog to invite wider discussion. A snapshot of some of our activities, achievements and future priorities is outlined below. We also highlight emerging insights from our consultations so far. These will help shape and inform our activity in the coming year. We’ll be encouraging collective ownership from government, private and voluntary sectors across the six priority areas. We will continue to focus on the needs of users, and to tackle the multiple barriers to digital inclusion, namely lack of access, motivation, trust and skills. Over 70 public, private and voluntary sector organisations now support activity under the Digital Inclusion Charter. DI Charter signatories have met at our biannual forums which have promoted sharing of good practice, policy development and matched corporate sponsorship to digital inclusion delivery programmes. Just last month we saw BT and Barclays launch a joint programme of free WiFi and digital support in libraries and community hubs across the country. Looking ahead, we’ll be working on boosting our partnership base strategically to channel investment and build collaboration across the DI agenda. A primary focus has been establishing the Digital Friends initiative, which encourages and motivates those with digital skills to share them with family, friends, employees, and customers. A future priority for the DI team will be developing persuasive messaging in support of this and a range of digital inclusion activities. A Digital Inclusion Outcomes Framework has been developed as a template for tracking digital inclusion in the UK and evaluating activities locally. This will help evidence the economic and social value of digital inclusion, demonstrate the case for investment, and begin to evidence what works. The team is creating a procurement framework to facilitate the purchase of digital training and support by departments and local government, with the aim of launching it next year. A number of our corporate partners are willing to invest in digital inclusion initiatives and we’re working with them to coordinate and match resource to need. 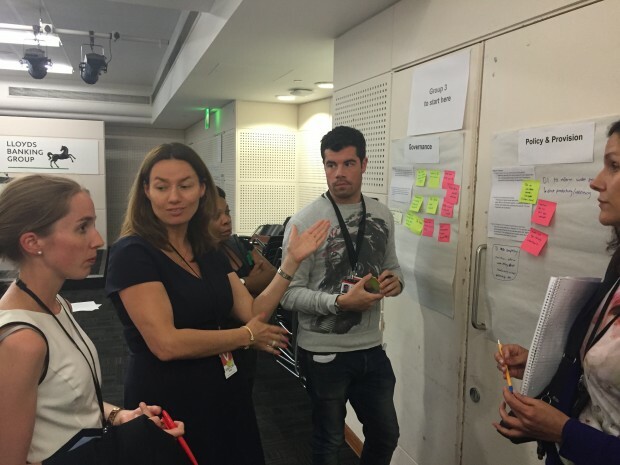 The DI team has been working closely with departments to help them identify where embedding digital inclusion into policy can support better outcomes and to ensure services build digital inclusion into the design of government transactional services. We’ve also been supporting the upskilling of civil servants by working with Civil Service Learning to strengthen their basic digital skills offer; and rolling out the Digital Friends initiative across government. Locally, we’ve been developing evidence of successful local tier initiatives that can be promoted and replicated. Effective governance is essential to enable collective decision-making that supports delivery of the Digital Inclusion Strategy. We’ve done this through the Digital Leaders Digital Inclusion Sub Group (a cross-government group) and the Digital Inclusion Delivery Board (a cross-sector board that brings together representatives of key sectors of the digital inclusion audience, actors and providers). Better links between the cross-government Sub-Group and Digital Inclusion Delivery Board, to bring all sectors together around shared goals. I take it you are aware of "OAP Internet Virgins" the TV series on Sky 1 which has been doing a great job in raising the profile of digital inclusion done well? Hi John, yes we're aware of that programme and know that it's doing a good job. We'd like to encourage more of that kind of programming from other broadcasters.